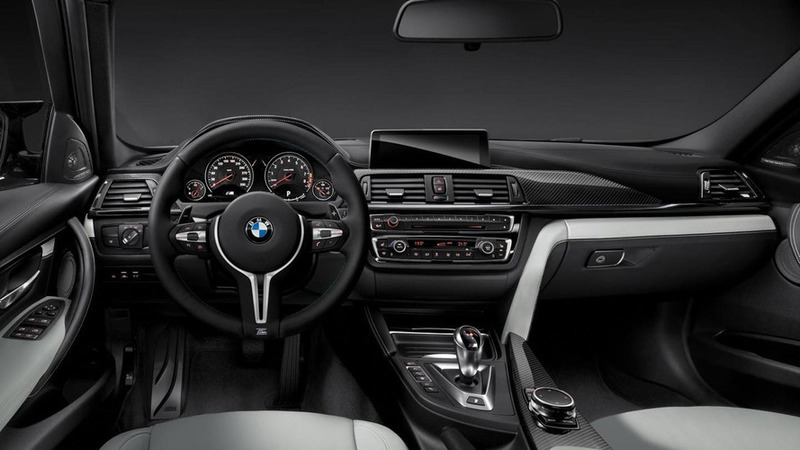 The highly anticipated 2014 BMW M3 Sedan and M4 Coupe have finally been revealed online, ahead of their public debut scheduled for next month at NAIAS in Detroit. At their heart is an inline-six high-revving TwinPower Turbo 3.0-liter engine delivering 431 HP (317 kW) and a maximum torque of 406 lb-ft (550 Nm). Compared to the outgoing generation, the new M3 is approximately 25 percent more fuel efficient and is around 80 kg (176 lbs) lighter. The CFRP roof brings weight savings of 5 kg (11 lbs) for the sedan and more than 6 kg (13 lbs) for the coupe. BMW says the cars will do 26.7 mpg US (32.1 mpg UK or 8.8 liters / 100 km) in the combined cycle with the manual and 28.3 mpg US (34 mpg UK or 8.3 liters / 100 km) with the DCT. BMW's engineers reworked the MacPherson strut front and multi-link rear suspension by using lightweight components which have reduced unsprung masses and increased rigidity at the same time. The M3 and M4 ride as standard of 18-inch alloy wheels wrapped around in 255/40 front and 275/40 rear tires, while optionally available are larger 19-inch rims. Both cars will do 0-62 mph (0-100 km/h) in 4.1 seconds when fitted the optional 7-speed M DCT or 4.3s with the standard six-speed manual gearbox. Top speed will be electronically limited to 155 mph (250 km/h) but for more money the limiter can be raised at 174 mph (280 km/h) once the client orders the M Driver's Package. The aforementioned seven-speed M DCT comes with launch control and a "smokey burnout" mode that allows a certain degree of wheel spin at low speeds, a similar feature which will allegedly be available for the new Ford Mustang as well. Stopping power will be provided by standard compound brakes or optional lighter BMW M carbon ceramic brakes. The new BMW M3 Sedan will be manufactured in Regensburg while the M4 Coupe is going to be assembled in Munich. Both cars will get their first public outing next month at the 2014 North American International Auto Show in Detroit.